A simple method to root I747MVLUFNE6 Android 4.4.2 KitKat Firmware is now available at NasirTech. Samsung Galaxy S3 SGH-I747M recently get updated to the I747MVLUFNE6 4.4.2 KitKat Firmware. If you yet to update the firmware, then update the same by following this link- I747MVLUFNE6 Android 4.4.2 KitKat Firmware for Galaxy S3 SGH-I747M- How to Install. Hope you updated this latest firmware on your device and now you can root the same using our simple tutorial below. The below guide will help you to root VLUFNE6 4.4.2 KitKat Firmware running on Galaxy S3 SGH-I747M. Continue reading the tutorial for complete guide. So, want to root Galaxy S3 SGH-I747M Running I747MVLUFNE6 4.4.2 KitKat Firmware? Continue reading this page to get all the necessary steps to successfully root your device. The root file (CF-Auto-Root) we used in this tutorial is safe and have nearly 100% success rate. We'll use Odin software to flash the root file. 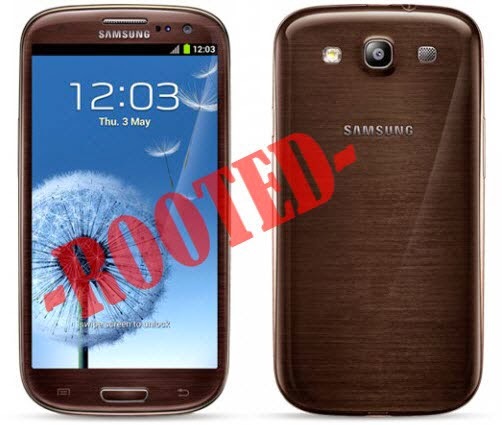 This rooting tutorial is only applicable for Samsung Galaxy S3 SGH-I747M model (d2can). So, don't try this in any other android device. Check your device model number from- Settings-About Phone. All the above pre-requisites are very important and must be followed before proceed to installation guide. Hope you get all the above points and done as mentioned. Now, you are ready to move to the final step of this tutorial where we have arranged a step by step details guide to root Galaxy S3 SGH-I747M running I747MVLUFNE6 4.4.2 KitKat firmware. Now, Switch off your phone and boot Galaxy S3 I747M into Download Mode by pressing and holding the Volume Down+Home+Power buttons together (long press until the boot screen appear), now press Volume Up key to proceed to Download Mode. Now, click on the AP button and select the CF-Auto-Root-d2can-d2vl-sghi747m.tar.md5 file. Congrats! You have completed the tutorial to root Galaxy S3 I747M running I747MVLUFNE6 4.4.2 KitKat Firmware. Hope you successfully done the rooting process. If you followed everything as mentioned in the above tutorial, then your Galaxy S3 I747M should now rooted and you have complete control over your device. Now, install apps that ask root permission or flash various custom ROMs. To verify your device is rooted or not, you can download and run the Root Checker App from Google Play Store. If you have any doubt or query about the tutorial, feel free to contact with us using the comment form below, and share your rooting experience with us. I've rooted my Samsung Galaxy S3 a hundred times before, but this is the first time I've tried rooting the KitKit 4.4.2 version, and for some reason it isn't working! Everything goes smoothly and it supposedly roots, and says "Pass", then reboots the phone as expected, but when I use a root checker utility, it says that the phone isn't rooted. Similar situation here. Picked up an S3 from Koodo last night. Process says PASS but it isn't rooted. Need root to move my stuff over with Titanium. Found an alternate method which appears to have worked. my baseband version is I747MVLUFNF2, will it still work? same based version as yours. didn't work for me. the alt approch---Towelroot, i can't even get to download step...so, as for now, my s3 is still un-rooted. tried to download Towelroot again by using IE on the phone. was able to instill this APP finally. but my phone "is not currently supported by this APP". it does not work !!! dont waste your time ! Hey Nazir, why not remove this till you fix it. No respect for non-working releases. Thanks! I haven't rooted a phone in a few years, but the samsung 4.4.2 has too many issues and I need to move on to something more reliable. This worked like a charm! spokane computer repair At Premier Virus Removal we fix and repair all your computer issues. Spokane valley computer repair services. Our team can also computer repair computer Spokane valley.